A big 'thank you' to the multiple tipsters who emailed us with details of the 'Easter Eggs' that are embedded in the Mike Frerichs - The Gaffeman - illustration over on http://www.gaffeman.com/. There were a bunch of you who successfully discovered two of them that we've covered already. First 'Easter Egg' is what Mike Frerichs - The Gaffeman - wears on his head: Earmuffs. The second one is what makes Mike Frerichs look like European Royalty: his love of sashes. But, there one was one tipster who emailed us yesterday with the third and final 'Easter Egg' in the Gaffeman. And...it was a tip of the cap to Mike Frerichs and his ability to consistently spell the office of "Treasurer" wrong. In fact, on a Daily Herald candidate questionnaire, he famously spelled it how the Gaffeman spells it: "Treasures". Thanks for playing along at home, tipsters. 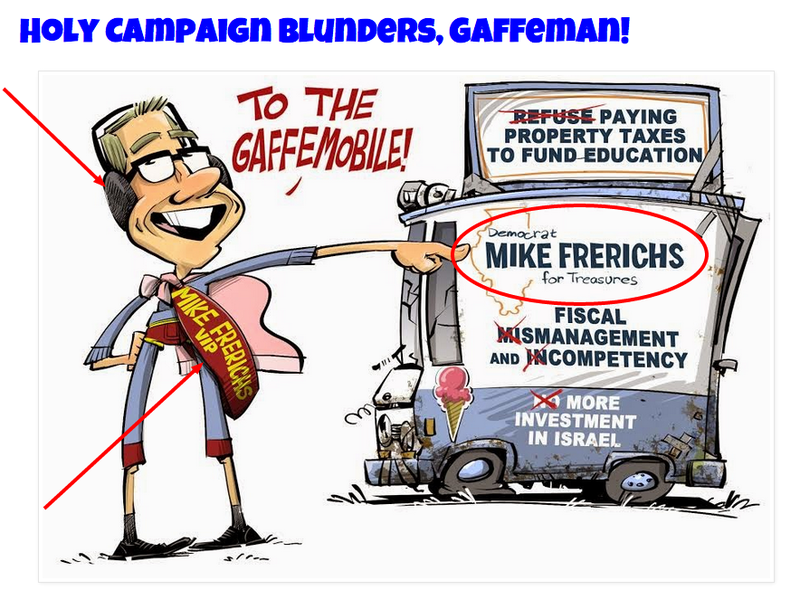 Keep up with the latest from Mike Frerichs as The Gaffeman at http://www.gaffeman.com/.